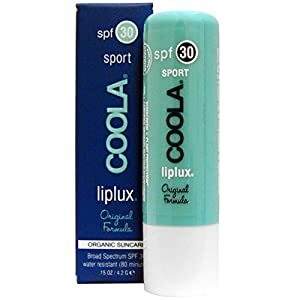 Timeless Sport Organic Suncare Broad Spectrum SPF 30 Water Resistant (80 Minutes) 70% + Certified Organic Inactives Plant Defense Ruthlessness Free Farm to Face Don't forget your lips. This all-in-one lip treatment moisturizes and protects with SPF 30 broad-spectrum UVA/UVB sunscreen defense. Our vitamin and antioxidant enriched formula soothes and nurtures, while our unique mix of fruit butters like Raspberry and Avocado hydrate the delicate skin of the lips. This item is unscented, but you will still wish to state MUAH! 70+% Certified Organic, Made with Natural Food Grade Active ingredients. 70%+ Certified Organic Hypoallergenic UVA/UVB Broad Spectrum Defense Vitamin and antioxidant enriched Water Resistant (80 minutes) No nano-sized particles Uses Assists avoid sunburn If used as directed with other sun defense measures (see Instructions), reduces the threat of skin cancer and early aging triggered by the sun.